My initial exposure to Batman apart from this animated incarnations were through his comics that my mother collected. Yes, she actually maintains a pretty decent Batman collection and I actually got to experience major arcs like Knightfall through her collection. And another great story was The Long Halloween - she actually has the individual issues! So I actually had no idea that Batman: Dark Victory existed as a direct sequel to the prior Jeph Loeb and Tim Sale creation prior to a recent Batman-centric sale over on comixology. And given how much I enjoyed The Long Halloween, I was certainly curious to see how Loeb intended to expand on the story. To be fair, a big part of the brilliance of The Long Halloween was the fact that it was a great murder mystery with some elusive serial killer at the heart of things. Figuring out who Holiday was become the driving force behind that story. Dark Victory on the other hand is an expansion of other themes introduced in the prior comic and also explored in the Year One comics from the period. And while there's still a serial killer on the loose, I actually found the serial killings sub-plot to be one of the weaker story elements in the arc. 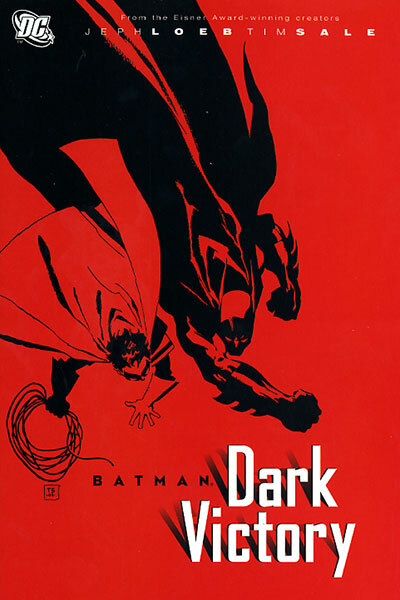 Synopsis: Batman: Dark Victory is a 13-issue comic book mini-series (or 14-issue when you count Issue #0) written by Jeph Loeb with art by Tim Sale. It's a direct sequel to Batman: The Long Halloween and it runs somewhat parallel to the story Catwoman: When in Rome. Holiday has been apprehended thanks to the efforts of Batman together with the Gotham City Police Department. However there's a new District Attorney in town, Janice Porter, who has replaced Harvey Dent, who has become the villain Two-Face after an acid-attack permanently scarred one half of his face. And things just aren't quite the same anymore given Porter is against Batman's methods and Jim Gordon is still settling into his new role as Police Commissioner. Thus Batman decides to continue his fight against Gotham's crime on his own, without the burden (and maybe the obligation to protect) Gordon and the GCPD. Finally, a large breakout at Arkham Asylum takes place and a number of villains manage to escape in the process - including Two-Face. And shortly after Holiday is released into house arrest with his family, a new series of serial killings start to take place involving various police officers past and present. Once again the murders take place on major holidays but this time the only unifying element involves notes left on each of the victims as written on stolen files from Harvey Dent's old records when he was still district attorney. First off, I can see how folks might only either love or hate Tim Sale's art. He makes great use of distorted features and sometimes outright inhuman proportions, especially for the villains. But I like the style and how it presents their criminal insanity in a visual manner, and thus you can distinctly tell characters apart. I won't go as far as saying it delineates between the good guy and the bad guys or something - there are too many shades of gray in Gotham after all. But on the whole it's a great visual treatment that really helps Batman's villains stand out more, making for more compelling fight sequences and such. From a narrative sense, there are some great themes being explored in this story. The big one in the first half of the arc is dealing with the loss of Harvey Dent. This was more than just dealing with a death of a friend or something. Instead we have the complete transformation of a person - the loss of a person's identity as he is now someone entirely different. This is the heart of the tragedy of Two-Face and this story really explored the impact of this event on Batman, Jim Gordon and other people around him. Batman and Gordon had a sort of deal working in the last story about working together to take down the five crime families that ruled Gotham's underworld. But now that was all lost. The core mystery was pretty good though. Sure, I kind of dismissed it as being a weaker story element in the opening of this review post, but that doesn't mean it was bad. I just found the emotional impact of the other story aspects being a lot more compelling. But the mystery is still a good one and while I had a number of guesses regarding who the new Holiday killer might have been, it was never totally obvious. And that made for interesting reading. Given the current show Gotham somewhat explores a similar period in Gotham's history, it disappoints me that the crime families on TV never seem as interesting or fleshed out as they have in these comics. There's a lot that can be done to make the TV crime families a lot more believable - and it doesn't necessarily involve introducing characters who are fated to become Batman super villains. The five families totally ruled Gotham before super villains came into their own. And these stories clearly demonstrate why guys with guys had the power and clout to have so much influence for so long. And the continued efforts to explore the nature of these families and the complex relationships that define Gotham's underworld are a big part of why this story works. Batman: Dark Victory is great story and a nice continuation of The Long Halloween that wasn't necessarily needed, but it's still pretty welcome. It's a great period in Batman history and one that I don't mind revisiting time and time again. Thus the comic gets 4 hangman notes that seem to implicate Harvey Dent out of a possible 5.